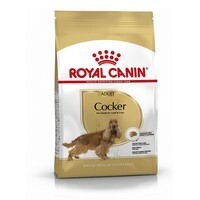 Royal Canin Cocker Spaniel Adult is a complete feed designed for both English and American Cocker Spaniels over 12 months old. Royal Canin Cocker Spaniel Adult helps support the skin's natural "barrier" role, maintain skin health and nourish the coat. Enriched with borage oil. Suitable for English and American Cocker Spaniel adult dogs over 12 months. Healthy Skin & Coat: Helps support the skin's "barrier role" (exclusive complex), maintain healthy skin and nourises coat. Ideal Weight: Helps maintain the breed's ideal healthy weight. Cardiac Tone: Contributes to maintaining a healthy cardiac muscle. Exclusive Kibble: Dental Health: The formula contains calcium chelators which help reduce tartar formation.